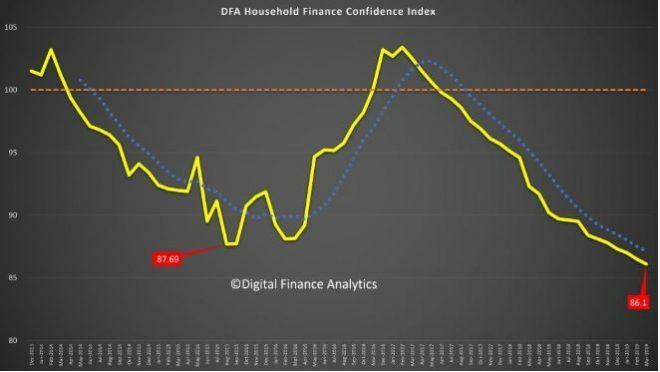 DFA has released the March 2019 Household Financial Confidence Index, which is based on our rolling 52,000 household surveys. The index reached a new low this past month as the weight of issues on many household’s shoulders pile up. The index fell to 86.1, well below the 100 neutral setting. 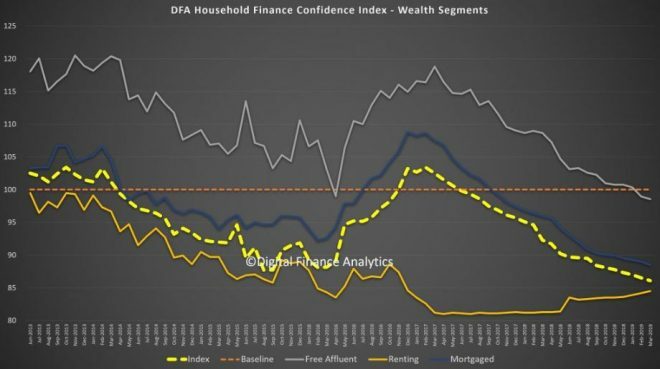 But in essence, all household segments, using our wealth lens, now sit below neutral, with those households with mortgages continuing to track lower, together with those who own property but are mortgage free. In fact the only segment showing a rise is the renting cohort, who see their rents in some centres (especially Sydney) on the decline. We find more among the Free Affluent segment, which is more aligned to the incumbent government, questioning their economic management. Across the age bands, younger households are more negative, and this highlights some of the inter-generational tensions which we suspect will be played up in the yet to be announced election campaign. In fact, households in the 50-60 year band are most confident (thanks to lower mortgages, bigger savings and controlled costs). 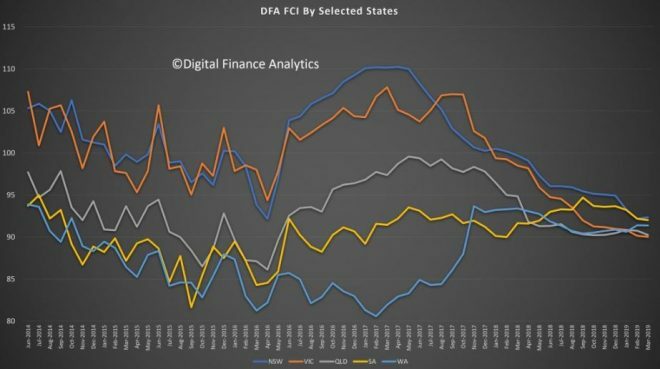 We also see the state indices have consolidated below the neutral setting, as the confidence from households in NSW and VIC are eroded. 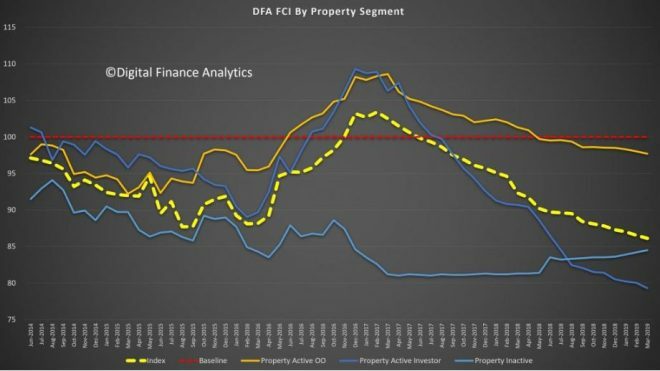 Much of this is connected with falling home prices. Across our property segmentation, property investors remain the most concerned, with falling home prices, the switch from interest only lending, lower net rental yields and the risks from changes to negative gearing and capital gains all playing in. On the other hand renters are finding some less expensive rentals now, and greater supply. Owner Occupied households are more positive, but still below neutral. This may mark the end of the great property-owning bonanza, at least for now. 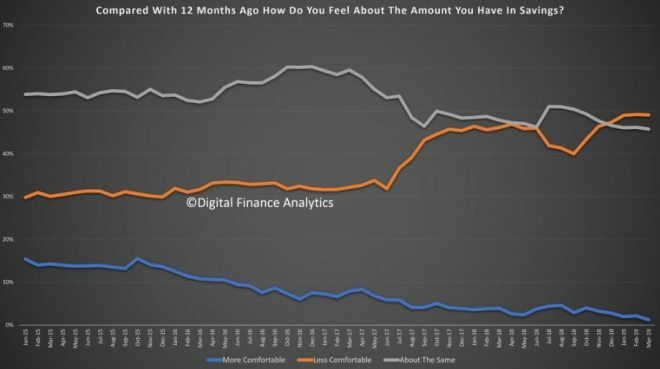 Looking across the moving parts of the index, more households are feeling insecure about their job prospects, thanks to pressure in the construction, retail and real estate sectors. 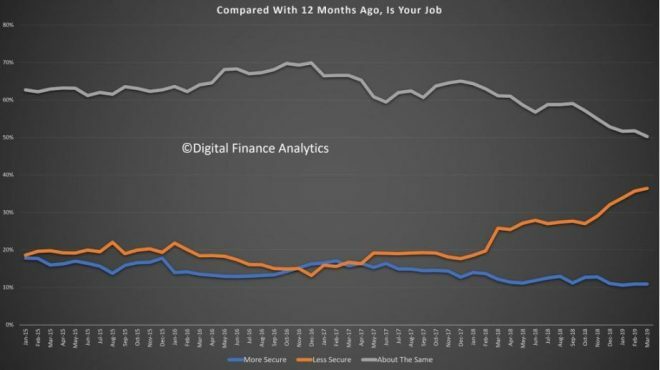 Savings are under pressure from first continued low bank deposit rates, and second, the need to raid savings to keep the household budget in balance. Share values did improve in the month, which offset some of the gloom. 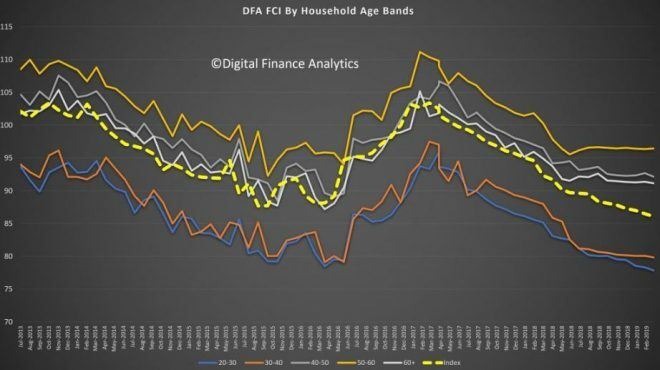 Households are felling the pressure of the high debt (and as the IMF recently showed not just among affluent households). 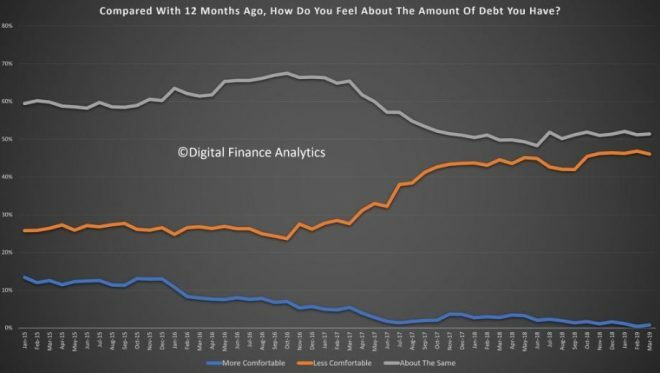 Just under half are now less comfortable with their debt than a year ago, a trend which started to rise in early 2017. Incomes, in real terms, remain under pressure, with those in the public sector experiencing small rises, but many in the private still in negative territory. 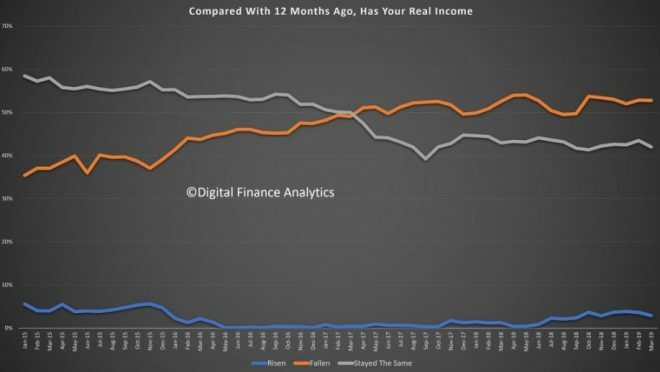 More than half say, in real terms, incomes have fallen over the past year. Costs continue to rise, with power prices, healthcare, health insurance, and child care all registering. Plus we are seeing more fallout from the drought which is also impacting some food costs. 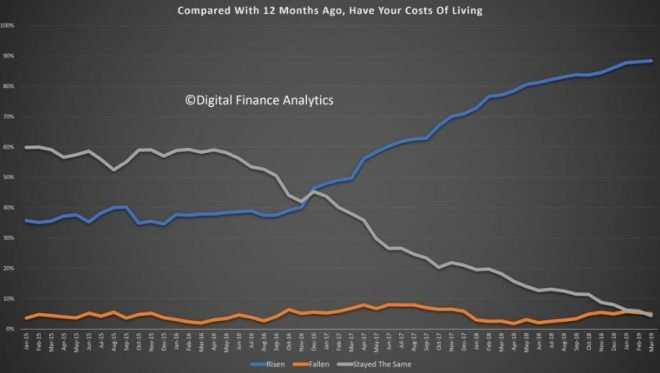 Nearly 90% of households said their costs are higher than a year ago. 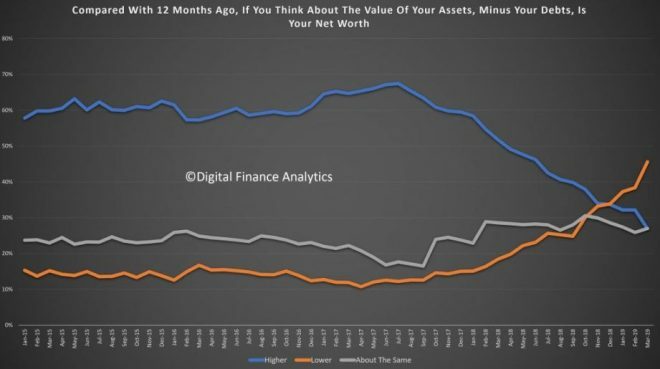 Finally, we put this all together in our assessment of net worth (assets minus loans etc). 45% of households say their net worth is lower, reflecting falls in the property sector, some lower share prices, and diminishing savings. Not a good look in the run up to an election! There is little evidence of anything which will change the momentum. Rate cuts and handouts to households may provide some short-term relief, but the economic settings are not correct to reverse the trend. So expect more bad news ahead. The misery has increased. It is difficult (impossible!) to make a meaningful change to mortgage levels when they are this high. Next up, the realisation debts that can’t be paid, won’t be paid. Do not underestimate the power of the Moron Side of the Force. Today I read that Perth RE Market may have just bottomed out !! It’s had more bottoms than a Russ Meyer film. I like the part about the wealth lens. I think I’ll start using it in general conversation. They should include it on playschool. The arched window, round, square, triangle, and the wealth lens! So how do nonproductive debt-inflated assets look through the wealth lens…. Hmm.. like a steaming pile of proverbial.